MANILA, Philippines - Move over, Justin. Psy is the new King of YouTube. Psy celebrated another milestone in his career when his "Gangnam Style" viral song surpassed label mate Justin Bieber's "Baby" as the most viewed video of all time on YouTube. The turning point happened last Saturday night when "Gangnam Style" slipped by "Baby" when both videos have accumulated more than 803 million views. By midnight Sunday, Psy's video had 816 million views against Bieber's 804 million views—a difference of 12 million views. Since "Gangnam Style" was uploaded last July 15, the video averaged six million views daily. Bieber's "Baby" was uploaded on Feb. 19, 2010, and it averaged about 795,000 daily views to date. Psy announced the milestone on Twitter. "#GangnamStyle just became the most watched video @YouTube!! #History youtu.be/9bZkp7q19f0 @youtube 에서," he posted. "Gangnam Style" was awarded by Guinness World Records as the most liked video on YouTube back in September. When the world record was announced, the music video had 2.14 million likes compared to LMFAO's "Party Rock Anthem" (1,574,963 likes), Bieber's 'Baby' (1,327,147) and Adele's "Rolling in the Deep" (1,245,641 likes), according to the Guinness site. As of Nov. 26, "Gagnam Style" had 5.42 million likes (and 331,996 dislikes) while "Baby" had 1.44 million likes (and 3.2 million dislikes). 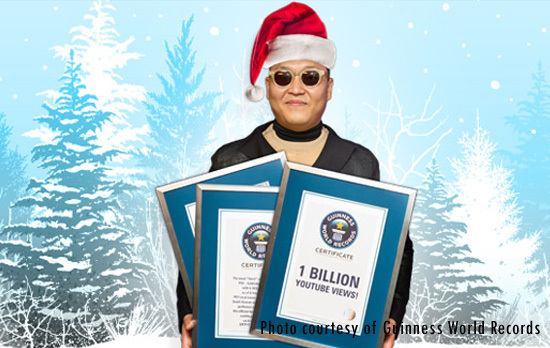 Guinness predicts that "Gangnam Style" will reach the one billion-view mark before Christmas Day. "But the records won't stop there - looking further ahead, 'Gangnam Style' is set to become the first online video in history to have been watched one billion times, with the clip set to reach the landmark on December 23rd this year. Could there be a more perfect Christmas present for PSY?" Guinness' community manager Dan Barrett wrote. Barrett wrote that his "best guess is that 'Gangnam Style' will reach the 1 billion landmark sometime between the 18th and 20th of December, (for comparison, at the current view rate, Justin Bieber's "Baby" will reach 1,000,000,000 views in March 2014), marking a third Guinness World Records title for PSY's video." He added, "We have a category open, and the certificate printer is waiting for you, PSY!"